In a combined meeting of the Board of Governors and the Senate (The Senate (Dutch: Senaat) executed the daily management of the University and consisted of all professors, chaired by the Rector Magnificus, who was chosen yearly.) 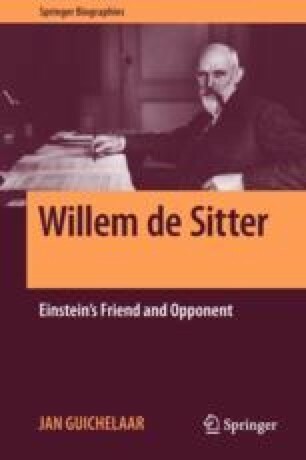 De Sitter took the oath as a professor on 21 October 1908. Directly after the oath he delivered his inaugural lecture: The New Methods in the Mechanics of Celestial Bodies [AUL, BG minutes] (De Sitter 1908). In a rough draft the title was The New Methods in the Mathematical Theory of the Movements of the Planets [ASL, Studies S8]. Astronomy is more than any other science designated to be studied in its own right, to be pursued as an art.